On the last May Bank Holiday of 2015 the Warwickshire town of Shipston-on-Stour held its annual Wool Fair in the centre of the town. This was historically run up to the end of the 19th century, and then revived in 2009 by the late Mayor elect Angela Noyce. Since then it has been run every year organised by a local group of volunteers. The Wool fair includes a display of rare breed sheep along with sheep shearing, local craft and food stalls, historic tractors, a flower display in St. Edmunds Church and music and entertainment from local bands, singers and dancers/Morris men. The fair was formally opened by honoured guest Bryan McNerney, after being announced by Shipston Town Cryer Marion Lowe in typical style, and then introduced by the MC for the day Robin Payne (who was later in the day seen playing behind his drum kit). Then the Shipston Town Band entertained the crowd with a few numbers. Then the Rev. Michael Harris of St. Edmunds Church said a prayer for the day and event before offering hot sausages on a stick to visitors to the church stall! The church was also hosted a flower festival which was part of the Wool Fair. The first band of the day Delirium then took to the stage (using the back of a truck kindly supplied by Hacklings Storage and Distribution) with a range of covers from bands including The Artic Monkeys. All of which was really enjoyed by the crowd sitting on the straw bales. From The Sheep ring Alan Scorer and James Tuffen, from Warwickshire College School of Agriculture, entertained the crowd while they demonstrated how to shear a sheep, and for these sheep it was their first time of shearing!. 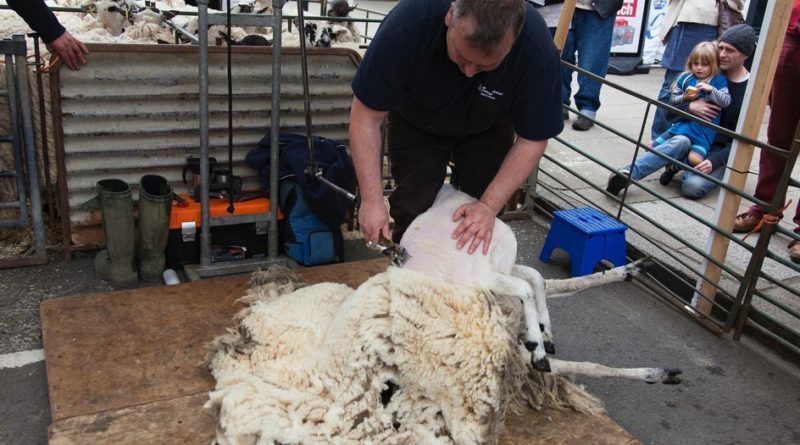 The Rare breeds of sheep included Cotswold, Shetland, Wiltshire Horn, Lincoln Longwool, Romney, Herdwick, Manx, Bluefaced Leicester, Wensleydale, Teeswater, Derbyshire Gritstone, Kerry Hill, Southdown, Leicester Longwool and Poll Dorset. The Rare Breeds Survival Trust (RBST) were on hand with the sheep on display in their pens, including Beth Sawbridge with Percy a Teeswater sheep. Each breed was introduced to the crowd by Ed Noble in the Show Ring, with some breeds familiar to those Countryfile watchers on the BBC, and Cotswold farmer Adam Henson. There were a couple of Fordson Tractors on display with the aqua blue examples displayed by Derek & Richard Webb. This Fordson Major Diesel example was manufactured in 1953 and brought by The Webb family in Evesham in 1961. It was used until the late 1990s and they restored to its current glory from 2006. The craft stalls were demonstrating a variety of spinning wheel and peg looms along with tapestry making. On the food side they were plenty of the local food shops with stands offering both hot and cold snacks. The Totally Local newspaper for Shipston-on-Stour was also being given out, and Shipston is proud to be the 10th happiest small town in the UK as recently reported in The Times newspaper. The 2nd band on the stage was the local Shipston High school group Battered Soul who did a variety of R&B numbers such as In the Midnight Hour (featured in the Alan Parker directed film The Commitments) with the large band both on the stage and in front. The lead singer had to make do with a chair after a recent rugby accident damaged his knee). The ever-increasing crowd really got in the music. The next act on display was a change with the ladies of the Shuvani Gypsy Dancers on display, getting some of the crowd to join into. Then we had a lovely singing group the Lady Belles Choir singing numbers from the 1940s. The day finished with the final band of the day Chuck Harriet, then Ilmington Morris men displayed their skills to the crowd before the Grand Finale with The Morrisons. Then the Town Cryer started off the formal closing ceremony with the Wool Fair Patrons and committee. 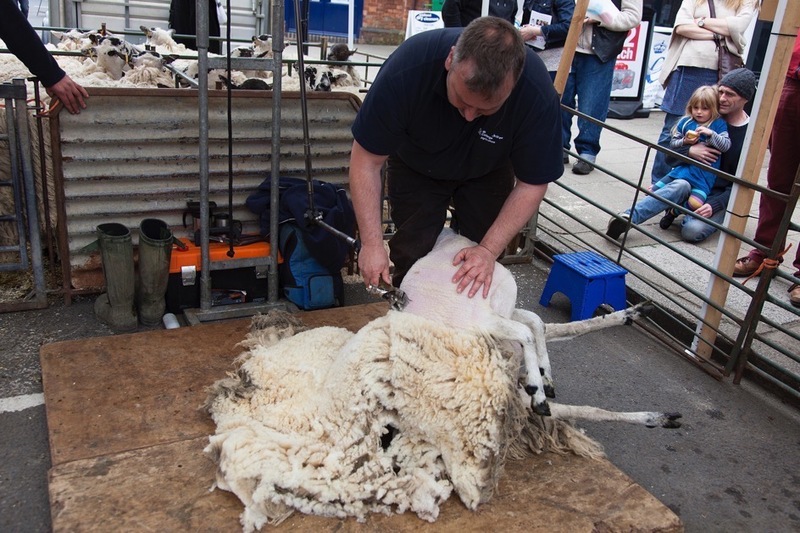 Looking forward now to the 2016 Wool Fair which will take place on Monday 30th May.